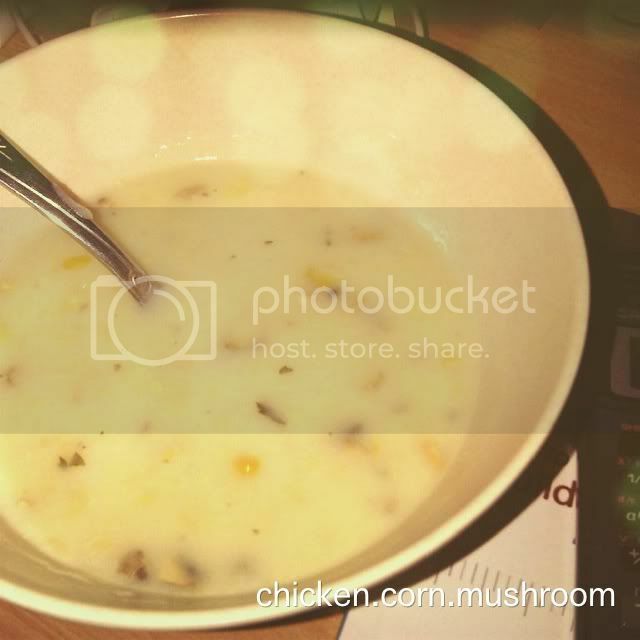 DIY: Chicken soup with corn and mushroom. Tonight is a beautiful night, a beginning of super long weekend for some people, and is a productive night day for me. Yay for Friday the 13th! I'm currently working on my second chapter (well, actually I am blogging - I know) and am feeling soooo inspired after reading so many books and e-books about my thesis topic. When the night was getting colder, I decided to make a chicken and mushroom soup. Also, we have kernel corns, so let's mix them up. The result: BLAH! Well, this failure is so discouraging. LOL. It makes me questions my cooking abilities. The recipe came from a valued source (aka Chef Ex-boyfriend), we've tried it together and succeed - so how could it have gone so wrong tonight? In the end I just come to the conclusion not to make that recipe again. Okay, maybe chicken and corn soup, WITHOUT mushroom because it smells like a shoe. FYI, I brought that soup to my bedroom (I know food is not allowed in here) and now my bedroom smells like a shoe. A SHOE! But not mine.